SAN ANTONIO (AP) – The Spurs are enjoying a resurgence after a rough stretch where the team lost its confidence while blowing late leads and uncharacteristically struggling defensively. 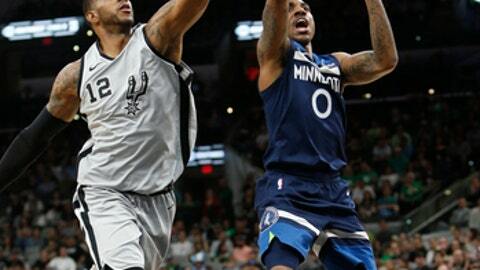 LaMarcus Aldridge had 39 points and 10 rebounds, and San Antonio overcame a sluggish start to beat the Minnesota Timberwolves 117-101 on Saturday night for its third straight win. Five days after dropping to 10th and out of playoff position, the Spurs remained seventh in the Western Conference while matching Minnesota and Utah’s 40-30 record. Karl-Anthony Towns had 23 points and nine rebounds for the Timberwolves, who dropped to sixth in the West behind the Jazz. The Spurs had lost three straight and nine of 11 but are now unbeaten halfway through a six-game homestand. It’s their first three-game winning streak since Dec. 28. San Antonio shot 84 percent in the second quarter, their best shooting quarter since 2010. The run was fueled by Aldridge. After missing his first five shots, Aldridge was 8 for 9 in the second quarter and finished 14 for 22 overall. Two nights after battling New Orleans’ Anthony Davis on both ends, Aldridge had to take on another All-Star in Towns. Aldridge responded by leading the Spurs in scoring for the 49th time this season while helping keep Towns in check. Aldridge scored 18 of 21 points during a five-minute stretch in the second quarter, including 12 straight for the Spurs. He capped the run by coming from the weak side to swat Towns’ floater deep into the seats. San Antonio finished with eight blocks and 11 steals while forcing 16 turnovers. Minnesota started quickly, shooting 78 percent from the floor in the first 5 1/2 minutes while San Antonio floundered at 17 percent. Spurs coach Gregg Popovich called timeout, only to watch the Timberwolves’ Jeff Teague steal the ball once play resumed. The Spurs responded behind veteran reserves Manu Ginobili, Tony Parker, Pau Gasol and Gay. San Antonio went on a 16-4 run bridging the first and second quarters to take a 29-26 lead. San Antonio finished with 32 assists while committing just five turnovers. Andrew Wiggins scored 21 points for Minnesota and Teague had 16. Timberwolves: Jimmy Butler missed his eighth straight game following right knee meniscus surgery. … Derrick Rose had eight points in 15 minutes, both season highs with Minnesota. … The Timberwolves are 9-49 against the Spurs in San Antonio. … Minnesota’s last win at San Antonio was April 17, 2013. Spurs: Popovich said before the game that Kawhi Leonard has not been medically cleared to return. He would not speculate on whether the star forward could play in the playoffs without playing again in the regular season. … San Antonio shot 86 percent in the third quarter against Golden State in 2010. Golden State will be without All-Stars Stephen Curry, Klay Thompson and Kevin Durant when it faces San Antonio on Monday. Timberwolves: Host Houston on Sunday night. Spurs: Host Golden State on Monday night.